Take a sip of the Capital Region! Albany, NY – Let’s be honest, who doesn&apos;t love a good cocktail? Especially when it has a cool name or special meaning! 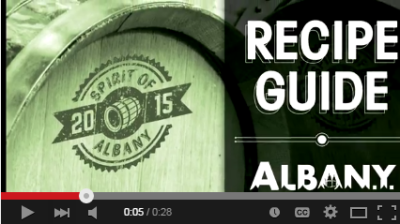 Over the past few months, we asked some of Albany&apos;s best mixologists to create an original recipe that they felt embodies the true Spirit of Albany- and they didn&apos;t let us down! In honor of New York State’s official fruit – the apple, several of our cocktail creators made a point of highlighting them in their recipes. For instance, the Apple Cider Sangria from The Ginger Man that is made with locally sourced apple cider to give their drink a delicious, crisp taste. Or you could try the Albany Apple Knocker Martini for a tangy and sweet taste. The Empire State Apple Manhattan is made with locally grown empire apples and Ironweed Bourbon which is distilled in downtown Albany at the Albany Distilling Company. Speaking of the Albany Distilling Company, their drink of choice was the Ironweed Old Fashioned and the Nine Pin Cider Work’s The Warehouse District features their Ironweed Rye Whiskey.The distillery is a modest operation, producing craft spirits one small batch at a time. 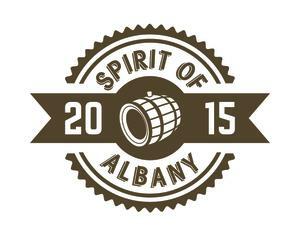 It is located in downtown Albany, not far from the site of the city’s original 18th century distillery. Kitchen + Bar which is located on the site of the Old Lansing House circa 1710. 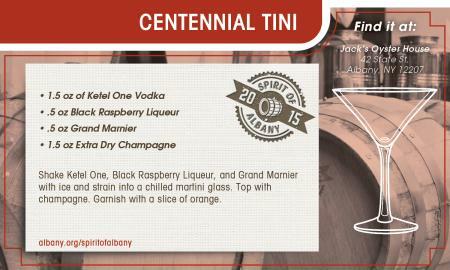 The close association Albany has with Troy and Schenectady is reflected in the Tri-City Martini . Seen in the image to the right, the three layers in this cocktail represent the individuality of each city. Each layer adds something unique to the cocktail just like each distinct city makes up the Capital Region. As you may or may not know, Albany has been hit with a pretty intense amount of snow and cold weather this year, so one sip of the Passion Fruit Caipiroska allows us to reminisce about the beautiful summer weather in Albany. The Roff Old Fashion which is made with Manhattan Rye that will warm the chill of the bitter cold out of you, while the refreshing taste of St. Germain reminds you that the warmth of spring is not too far away. 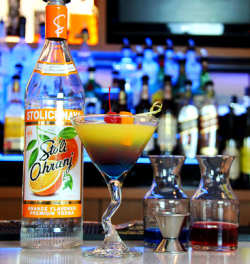 This cocktail exemplifies the spirt of the people of Albany and the beauty and magic within our diverse seasons. The recipe card above is for Jack’s Oyster House’s Centennial Tini which celebrates the centennial of not only one of Albany&apos;s great landmarks, but also celebrates a family that embodies the true spirit of the city it calls home.